Csaba Laszlo had promised to make changes after the Arbroath game, and he was true to his word as four changes were made with Matty Smith, Callum Booth, Adam Barton and Matej Rakovan coming into the side, the three latter players all making their United debuts. Despite being United’s best player against Arbroath, Declan Glass was dropped to the bench. Jamie Robson and Ben Siegrist were also substitutes this time, with Fraser Aird dropping out altogether through injury. 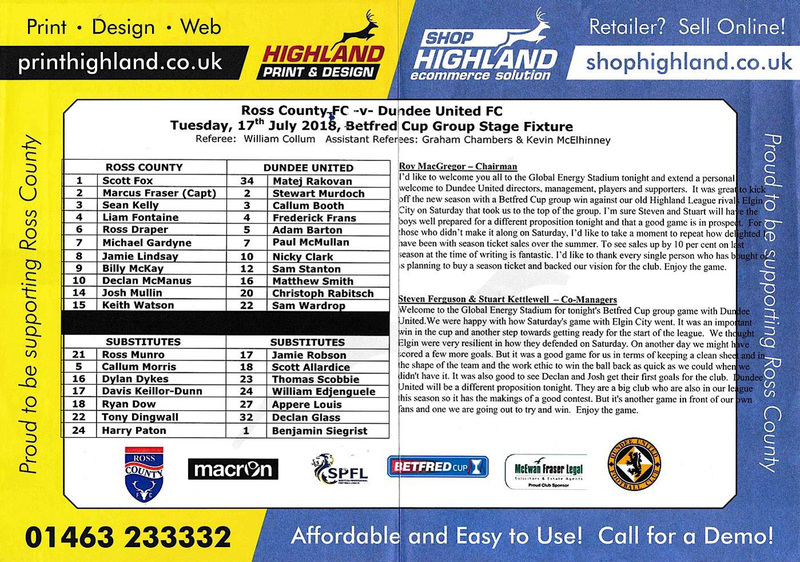 Ross County had no fewer than five former United players in their matchday squad, with Michael Gardyne, Billy Mckay and Keith Watson starting and Ryan Dow and Callum Morris on the bench. The start of the game was fairly uneventful. Although both sides were knocking the ball around comfortably and confidently in the early stages, they did not create any chances in the early stages. Both sides seemed content to let their opponents play the ball around in front of them. A couple of strong challenges on Michael Gardyne by Christophe Rabitsch looked set to ignite proceedings, but it took a full fifteen minutes for the first chance to be created. Even then, Frederic Frans could not take advantage of the space offered to him by the Ross County defence, heading over the bar from a Paul McMullan free kick when he probably should have done better. There was a similar chance at the other end three minutes later after Nicky Clark conceded a free kick out wide with a foul on Ross Draper, and again the chance was wasted. Josh Mullin played the ball into the middle to where Sean Kelly was unmarked, but again he could only head over the bar with the goal at his mercy. After 24 minutes, Matej Rakovan made his first save as United goalkeeper when Jamie Lindsay shot from the edge of the box, forcing the Slovakian keeper into a fine save. With ten minutes to go in the half, Liam Fontaine collided with Matej Rakovan, to the evident ire of several United players who clearly thought that Fontaine could have avoided the contact. Ironically, it was Fontaine who was left worse off by the collision and he had to be replaced soon afterwards by Callum Morris. Both sides had shots cleared off the line as the half drew towards its end. Firstly, Paul McMullan was called upon to clear a Keith Watson header from his own goal line, and then at the other end Adam Barton headed a Christophe Rabitsch corner towards goal, but Keith Watson popped up to prevent Barton scoring on his United debut. The second half proved to be a livelier affair. The first chance came for the home side within the first two minutes, as a clever header by Billy Mckay sent Declan McManus racing through on goal, but the former Dunfermline player was adjudged to have been in an offside position. Paul McMullan made a couple of good runs at the other end, but the final ball was somewhat lacking. Ten minutes into the half saw a great cross from Adam Barton on the left which Michael Gardyne did well to divert behind his own goal before any United player could take advantage. Frederic Frans then had to look lively to clear a Ross Draper cross just before Declan McManus could get to the ball for an easy tap-in. Declan Glass came on for Matty Smith on the hour mark and nearly opened the scoring within a couple of minutes as he hit a ferocious shot from 20 yards out that Scott Fox did brilliantly to save. The United youngster had a further attempt blocked a couple of minutes later as both teams began to chase the win, leading to a much more open game. 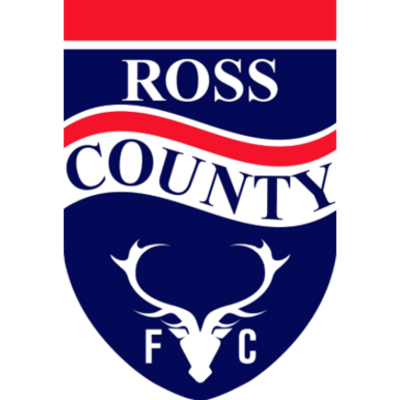 Ross County brought on Davis Keillor-Dunn and the youngster almost had an immediate impact as he played a lovely reverse pass through to Billy Mckay, but Rakovan was able to get to the ball just before the Ross County striker. The United keeper saved well from McManus soon afterwards as the home side upped the pressure. The play was raging from end to end at this point, and midway through the half Glass hit a shot over the bar, followed by Michael Gardyne curling the ball just wide at the other end. The former United player then hit a shot over the bar before Declan McManus cut in from the left and suddenly found himself with time and space in the United penalty area. Fortunately for United, Matej Rakovan was able to smother the ball before he could get a shot away. With ten minutes to go, United had a great chance to seal the three points after Sam Stanton was brought down in the box by Michael Gardyne. However, the chance was to be squandered as Nicky Clark saw his spot kick saved by Scott Fox. The ball rebounded back to Clark and he looks certain to knock the ball into the net, but his follow-up effort was somehow diverted over the bar by the Ross County goalkeeper. United were made to pay for that miss a couple of minutes later when Ross County took the lead. Substitute Ryan Dow got the ball on the right. He twisted and turned to try and get some space, then played in a cross which Jamie Lindsay headed past Matej Rakovan. It was maybe harsh on United but it illustrated what can happen when you don’t take your chances. Indeed, the move started from a goal kick at the other end after a Paul McMullan free kick from out wide went miles over the bar. Two minutes later, County came close to doubling their lead with a shot from the edge of the area from Davis Keillor-Dunn, but the ball whistled just past the post. United were unable to get back into the game, and in stoppage time the home side should have got a second goal when Declan McManus was thwarted by Matej Rakovan. 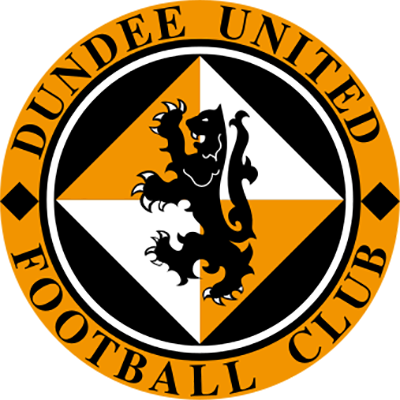 The defeat meant United were left with a solitary point after two group games and meant that their chances of qualifying for the last 16 of the Betfred Cup were already virtually non-existent.